Prysm Visual Workplace, a cloud-based platform, is now compatible with third-party hardware. Demonstrations on third-party hardware, as well as Prysm displays, will be available in its booth. In addition, the company is enhancing the offerings available through Visual Workplace, with Live Source Streaming, Quick Start, and Wireless Screen Sharing. Live Source Streaming allows all participants using Prysm Visual Workplace, regardless of location or the device they are using, to view and manipulate all live sources displayed in a common workspace. By utilizing a live source, an individual can quickly share device content, including BYOD connected devices, personal devices (laptop, mobile device), in-room PC, videoconference system, Apple TV, document camera, and security cameras. Prysm Quick StartPrysm Quick Start enables employees who do not yet have a Prysm account, or are guests in a room with a Prysm-enabled display, to access the Prysm Visual Workplace for immediate collaboration capabilities. While in Quick Start, participants can pair devices, sketch using a new sketchboard, and share information using many of the capabilities of Prysm Visual Workplace. 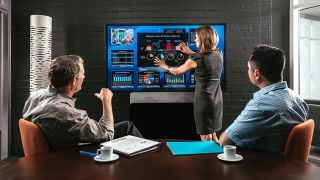 Quick Start provides users a fast entry point to Prysm Visual Workplace where they can quickly brainstorm and capture thoughts from an ad hoc meeting. Wireless Screen Sharing allows users to wirelessly display a laptop, tablet, or mobile device to a Prysm Display. In conjunction with Prysm Quick Start, the two capabilities enable users to quickly collaborate on a wide variety of devices so their meetings, ad hoc or planned, can include content from all users who can easily and quickly join and contribute to a meeting.